The most urgent issue of the position is life for the group at the top. Living is not difficult at the moment, but White wants more than simply life after losing so much in the opening. White 1 is a greedy move and a mistake. White saw a small life but wanted to get a little bit more from the position. It is wrong however. If White lived, no move in the vicinity would be so urgent and White would have some yose move. Black 2 hit the same eye-forming point and now White does not have even one eye at the bottom. White 3 forms an eye in a different place. White expected Black to close the position, and let White live small. 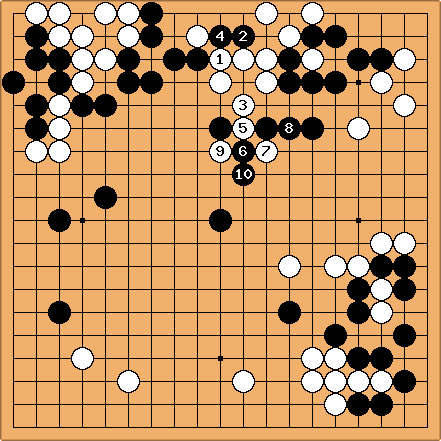 Black plays 4 however with the aim of killing the group. This is the point to talk about a ko possibility. Should have White fought this ko while running away? I don't know the answer. It is easy to break away while fighting this ko, because Black would have to find a ko threat elsewhere while any escaping move for White will be a ko threat. But the ko itself is big. Perhaps the most important consideration is that Black will be able to start this ko at a moment he choses (but not while chasing White's group). Can anybody give an opinion on the matter? White tries to escape with 5 and Black stops that with 6. White has to cut with 7. Black's 8 is a thick, calm and shapeful move, but Black refuses to make the ponnuki. At this moment Black could choose the direction in which to chase White. Do you think that the choice in the game was correct? White 9 cuts from a different side and Black has to pull out his stone in atari with 10.